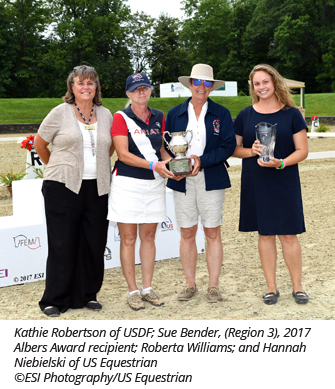 Lexington, KY (August 7, 2017) – The United States Dressage Federation (USDF) is pleased to announce that the Albers Award perpetual trophy was awarded to Region 3 Chef d’Equipe Sue Bender, at this year’s USDF North American Junior & Young Rider Dressage Championships, as part of the Adequan®/FEI North American Junior & Young Rider Championships presented by Gotham North (NAJYRC). “To say that Sue Bender is devoted to her Region 3 teams is an understatement. She works tirelessly, all year, to give the athletes the best NAJYRC competition experience that she can. She never stops advocating for her teams. She truly demonstrates what the Albers Award seeks to reward,” stated Roberta Williams, USDF FEI Jr/YR Committee Chair. The Albers Award is named in honor of long time USDF Region 1 Chef d’Equipe, supporter, and good friend, Patsy Albers. The award is presented annually at the USDF North American Junior & Young Rider Dressage Championships, to the dressage chef d’equipe who best demonstrates the same level of dedication, enthusiasm, and team spirit shown by Patsy, throughout the years. The award is open to all of the dressage chefs d’equipe, and any competitor or chef d’equipe can nominate a candidate by submitting a written explanation as to why that chef deserves to win the Albers Award. The NAJYRC is the premier equestrian competition in North America for junior and young riders, age 14-21. Young equestrians vie for team and individual FEI medals in the three Olympic equestrian disciplines of show jumping, dressage, and eventing, the Paralympic discipline of para-dressage, and the FEI World Equestrian Games disciplines of reining and endurance. This entry was posted in FEI & USEF Dressage News, South Florida News on August 10, 2017 by ludlumfarms.